I have always had a hard time eating breakfast. I wait until the last moment to get myself out of bed and start my day. Mornings are for making lunches, walking the dog, taking a shower and the last thing on my mind is food. So I tend to skip breakfast and then when lunch finally rolls around I eat everything in sight. I am trying to get my act together and eat a little something to start the day. 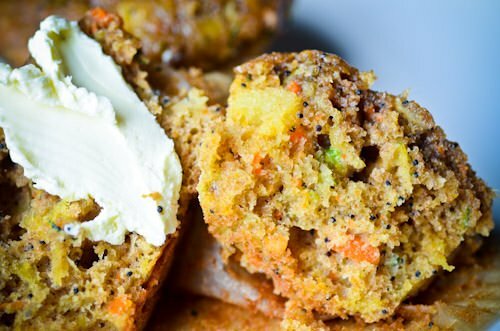 These muffins are filled with zucchini, carrots and pineapple and are made with greek yogurt and whole wheat flour, so they aren’t too heavy. I love to eat them topped off with some honey sweetened cream cheese. These are one of my favorite things to eat for breakfast, they are quick to make, freeze well and taste like dessert. I mean what is better than starting your day off with a piece of cake? Pre-heat oven to 350 degrees. 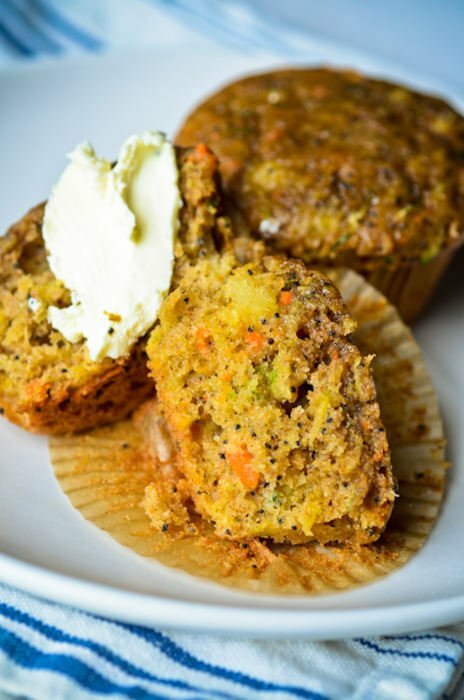 Butter and flour or line 2 muffin tins with cupcake liners. In a medium bowl combine the oil, yogurt, sugars, eggs and vanilla until well combined. Place the grated zucchini between a few layers of paper towels and squeeze out the excess moisture. 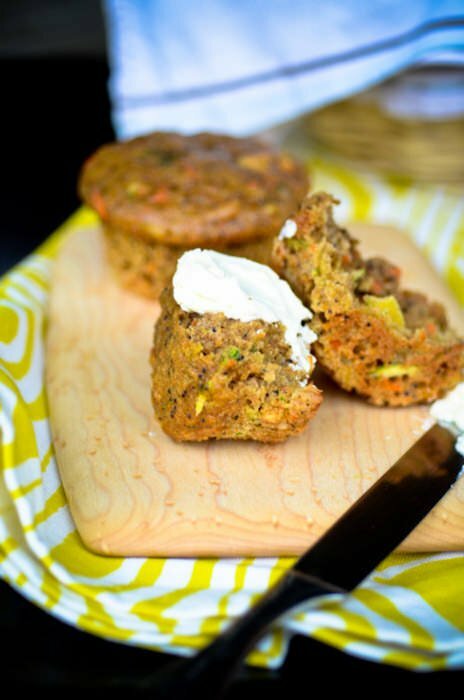 Fluff up the zucchini and add it along with the carrots and pineapple to the batter. In a separate bowl, combine the flours with the baking soda, baking powder, salt, cinnamon and poppy seeds. Add these dry ingredients to the wet in two separate additions, stirring between each addition. Divide the batter among the muffin tins filling each about 3/4 full. Bake for 20 minutes just until the tops are set and golden brown. 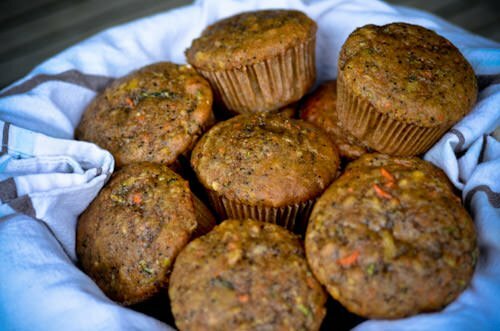 Be careful not to overbake, the muffins will continue to cook when they are removed from the oven and as it is cooling. Let cool in the tins for 10 minutes and then remove to a rack to finish cooling.